In the early 20th century, an eccentric businessman named Roger Babson declared gravity to be mankind’s greatest threat. He devoted part of his fortune to defeating it, creating the Gravity Research Foundation which sponsors a yearly essay contest focused on the understanding of gravity. This contest has been won by the likes of Stephen Hawking and Lawrence Krauss. Despite its fringe beginnings, the annual gravity essay contest serves as a historical record of the zeitgeist of gravitational research, and may be attributed to bridging the gap between the the decline of gravity research after Einstein and its re-ignition in the quest for quantum gravity. Roger Babson. Image from Wikipedia. Roger Babson was born in Massachusetts in 1875. He attended MIT and worked for several investment firms before founding his own business analysis firm, which still exists today. He founded Babson College near Boston, wrote several books on investing, ran for president against Franklin Roosevelt, and was involved in the early development of the parking meter. He had a theory that by applying Newton’s laws of motion and gravity to the stock market he could predict its ebb and flow, and nominally used this to predict the 1929 market crash. Reading his brief biography, I can’t help but be reminded of today’s larger-than-life investment magnate and wannabe politician, Donald Trump [Authors note, 2018: Hindsight is 20/20]. Monument in New Boston, from Wikipedia. The website contains the winning essays dating back to 1949, and a list of abstracts dates back to 1961 (the more recent papers from these abstracts can often be found online). The winning essay in 1949 was by a University of Wisconsin undergraduate named David Wittry. It was titled “The possibility of discovering an absorber insulator or reflector for gravity waves.” Reading the introduction, it is interesting to note that even in 1949 the same terminology, “crackpot,” was used as it is now to describe people with fringe physics ideas. The paper begins with a review of some contemporary experiments on the universality of gravitation (e.g. by Eotvos). His essay is interested on whether a body (B) in between two others (A and C) will screen the gravitational field from A felt at C. If this happened, there might be a material that was an especially good screen of gravitational fields, and could be used for some kind of gravity shield. He notes that if this were the case then the moon would recede slightly from the Earth during each lunar eclipse, due to the screening of the sun’s gravity from the Earth, and mentions some other effects that also don’t happen. He continues with a review of potential equivalence violations and their magnitudes, and uses the various non-observations of gravitational permeability to rule out alternate theories of gravity that were proposed at the time. Today, this paper seems to be about a topic that nobody would really take seriously, but it is a well-written and scientifically rigorous paper and does not make any outlandish claims. Today the winners are firmly on the “hot topics” of gravity research, although the honorable mentions cover a wide range of topics. The essays are evaluated by a panel of judges, and prizes for a top five range from $500 to $4000, and appear in an edition of the International Journal of Modern Physics D, along with the “honorable mentions” that undergo additional peer review. The list of winners is a who’s-who of theoretical physics: Stephen Hawking (who has won six awards but only one First Prize), Jacob Bekenstein, Frank Wilczek, Richard Arnowitt, Bryce deWitt, John Ellis, Gabriel Veneziano, Gerardus t’Hooft, George Smoot, John Archibald Wheeler, Sean Carroll, and a bunch of other people that I’ve heard of although not everyone has. Many of them got their starts by entering this contest, others won it after they were already established researchers. It may be possible to credit this contest with maintaining a sense of continuity in gravitational research, which had died down after Einstein’s work in the early 20th century, before it once again became a “hot topic” in the late 20th century. As historian David Kaiser discusses in his chapter “Roger Babson and the Rediscovery of General Relativity,” in Kaiser, Making Theory: Producing Physics and Physicists in Postwar America (Ph.D. dissertation, Harvard University, 2000), pp. 567-595., by the 1940s research in general relativity had been relegated to mathematics departments and was thought almost irrelevant to physics. When Babson began his contest, it was one of the only outlets for gravitational physics research at a time when the main focus was on nuclear research. The output of gravitational research worldwide was greatly accelerated by foundation, and in 1953 Bryce deWitt’s essay “New Directions for Research in the Theory of Gravitation” laid down a lot of the early framework for the attempted description of gravity in the formalism of quantum field theory, what we now call quantum gravity. In 1957, the “Conference on the Role of Gravitation in Physics” was one of the first gatherings of gravity researchers worldwide, and started a new chapter in the quest to understand gravity. Kaiser argues that Babson’s organization and contest were responsible for this renewed scientific interest in gravity which had been experiencing a lull. I have some personal experience with this contest, as I entered it last year. Ever since I became aware of the contest around 2010 I had always toyed with the idea of entering it. After my tunnel-through-the-Earth paper was finally accepted to the American Journal of Physics at the end of 2014, I got the idea of writing an extension of the paper that would use a more general model of gravity inside a planet and try to fit that model to what was known about the interiors of various planets. I managed to finish the paper just before the deadline for the contest on March 31 2015 (it was fairly hacked together in the last minute), about a week after my paper went viral, which gave me some nice momentum to finish it. The contest is currently run by George Rideout, Jr., the son of Babson’s business partner. The contest is entered by sending your essay to his AOL email address. I did that, and he promptly replied thanking me. About two months later the awards were posted on the Gravity Research Foundation website with literally zero fanfare. I found out that I did not win (Nobel Laureate Gerardus t’Hooft won). I didn’t expect to win, but I was a bit disappointed to find out that I didn’t even get an honorable mention. There were about 30 of those, but I don’t know many entries there were. My essay could have been 36/40, 36/100, or 99/100 but I don’t know. I eventually published another version on arxiv. In addition to his foundation in New Boston (which ended operations after he died in 1967) and his yearly contest, Babson also left a number of stone monuments around the East Coast of the United States, mostly in New England. Some of these contain financial tips (one is just a boulder that has “KEEP OUT OF DEBT” engraved on it), but many are devoted to his anti-gravity crusade. Pictures of these monuments can be found on the Wikipedia page of the foundation, but recently I went to visit one of these, at Tufts University. 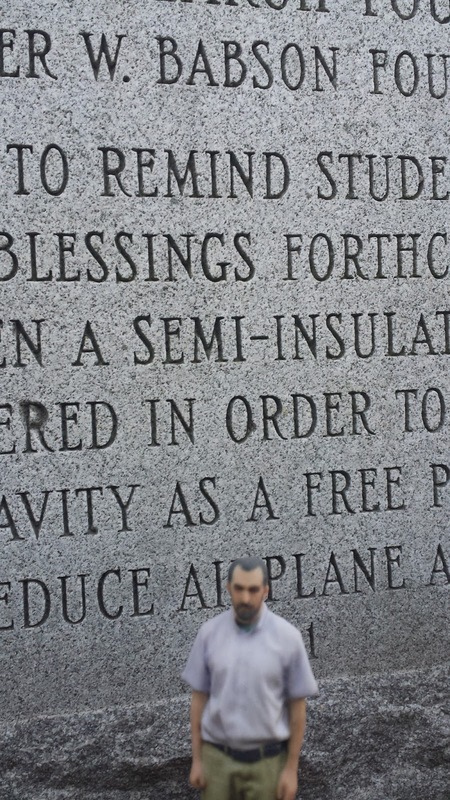 The cosmology research group at Tufts was generously endowed by Babson, and they have a tradition of dropping apples on the heads of graduating students next to the monument, and used to dig it up every year and try to carry it to see if gravity had been defeated yet. One intrepid blogger went on a quest to visit all the monuments in New England. Overall, I think this annual contest is a neat little part of physics history, and a potentially important part of keeping gravitational research cohesive throughout the late 20th century. David Kaiser, “Roger Babson and the Rediscovery of General Relativity,” in Kaiser, Making Theory: Producing Physics and Physicists in Postwar America (Ph.D. dissertation, Harvard University, 2000), pp. 567-595. [quote=”Greg Bernhardt, post: 5454341″]What an interesting legacy Roger Babson left! [/quote]That was a fantastic read! [quote=”OwlHoot, post: 5455260″]Very interesting article – Just shows that humble, even discreditable, origins can have a commendable outcome.